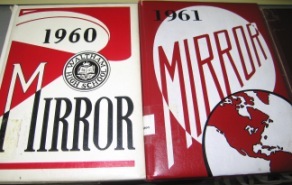 Did you know that in the Waltham Room, our local history collection, some of the most often requested items are copies of The Mirror, the Waltham High School yearbook? Whether for tracking old friends, genealogy, use by the media, or simply reminiscing, hardly a week goes by that someone doesn’t come in to use them. We have a pretty complete collection going back to 1904 but, of course, there are some we are lacking that we would love to provide. Can you help? We mostly need those from the 1980’s, 1950’s and 1930’s, but almost none would be refused. Please email me if you have one you could part with for a good cause. Many thanks. Kate Tranquada and Louise Goldstein met with Marybeth Duffy, the Director of the Waltham Council on Aging on Wednesday afternoon, November 14th at 2:30PM. The weather was fine as the two librarians walked up Main Street. Marybeth offered a tour of the facility which boasts a computer lab, a lovely living room area with a fireplace, a sizable ballroom, and a kiln! Louise and Kate discussed programming options with Ms. Duffy. It was decided that the way to begin would be with “An Afternoon With Books”. this program would be held in the living room area. One of the WPL’s top notch librarians would lead the program. The first “Afternoon With Books” was held on Wednesday, Januay 9th at 3:ooPM. The fireplace was lit, the Christmas tree was decorated, and six women sat down to chat about books. Time flew by as titles were discussed. Louise highlighted three titles; Memoirs of a Geisha–by Arthur Golden, King’s Oak by Anne Rivers Siddons and My Sister’s Keeper by Jodi Picoult. Louise brought a selection of WPL large type and regular type fiction and non fiction. Seniors were able to browse and even check out materials. Louise took down the information and then typed it into the computers at the library. Each attendee was given a complimentary copy of the Book Page. Members enjoyed cookies and conversation! We are holding our second Afternoon with books on Wednesday, February 6th at 3:00PM. This second session will be hosted by Laura Bernheim. The March 5th Afternoon With Books will be hosted by Paula Cerrato. Stay tuned for our April Afternoon which will feature Indian Culture, hosted by Bela Kaul! Whenever I have to do research that involves old newspapers, I always cringe at the thought of using a microfilm machine with an illegible printer. 1. Our new microfilm machine is simple to use! 2. The new microfilm machine scans the images to a computer so that you can view and adjust your image before you print. 3. When you print, the quality is much better than the old machine because the image is sent to a laser printer. 4. You can save all images to a USB/flash drive. The Minuteman Library Network unveiled its new catalog on November 1. Patrons can still look up books located in any of the 41 libraries in the Minuteman Network, reserve and renew books from home, and freeze their hold lists during long vacations. But, now patrons can do a lot more. Each listed entry has a picture of the book cover, links to book reviews (when available), suggested titles, and a book summary. Patrons can even rate the titles using stars. One of the most exciting features of the new catalog is that patrons can pay their fines online using their credit cards. (This feature is self serve and is only available through the online catalog and not at our circulation desks). For more information about that and the catalog, in general, please visit Minuteman’s FAQ’s. * Bentley College students offer tax assistance through the VITA Program. The program will be offered in Room 101 in Morrison Hall on Forest Street at Bentley, from February 11 – April 11. Assistance will be available on Tuesdays and Thursdays from 5:00 – 8:00 pm and Saturdays from 10:00 am – 4:00 pm. The program will not be offered from March 10 – March 20. If you have any questions, please call 781-891-2714. Welcome to Waltham Public Library’s brand new blog. You might be wondering what the purpose of this blog is… Well, it is a place where library staff members write about the library and all that it offers. Topics might include a favorite book, information about one of our research databases, a How To, or more information on a special event that is being held at the library. Be sure to subscribe to our RSS feed. If you don’t know what RSS is, read this. If you choose not to use RSS, visit this page about once a week, since our plan is to post one blog entry a week; however, sometimes, we might be posting a little more or a little less. I hope you enjoy our new blog and be sure to check out our Book Club Blog.